During the Early Archaic period, hunters continued to use spears for hunting. They used the same tools, with shorter handles, as knives. At about the same time, someone, or perhaps many people at different times and places, developed a new weapon. The atlatl or spear thrower enabled Archaic hunters to throw their spears with great force. The atlatl appeared in Illinois at least 10,000 years ago (8,000 B.C.). The handle with its hooked tip had the effect of lengthening the throwing arm, allowing Archaic hunters to throw their spears harder and more accurately from greater distances. A hunter held the atlatl by one end, set the end of the spear in the hook of the atlatl, and launched the spear at his prey with a snap of his forearm. Bannerstone or atlatl weight, Randolph County. A bannerstone is a ground stone tool with a hole drilled into it so that it would slip onto a circular piece of wood. Some archaeologists think bannerstones were part of an atlatl. The bannerstone may have been used as a weight to improve the performance of the atlatl. Birdstone or atlatl weight, Lima Lake site, western Illinois. 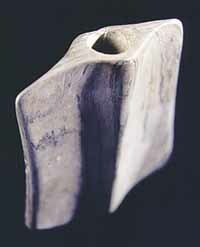 A birdstone is another form of ground stone tool. Small holes were drilled in either end of the stone to fastened it to a rod, perhaps an atlatl. The symbol of the bird probably had spiritual meaning to the hunter. Distinctive weights on the shaft, called bannerstones or birdstones, may have adjusted the balance of an atlatl and been intended to give ritual power to the hunter. Archaic dart points, western Illinois. Archaic dart points, western Illinois. Archaeologists interpret a change in the size of projectile points in several ways. One idea is that the change in size marks the beginning of the use of the atlatl. Another idea is that the size of the projectile point is related to the type of an animal being hunted. For example, large points would not be as effective when hunting a small, quick animal like a rabbit. 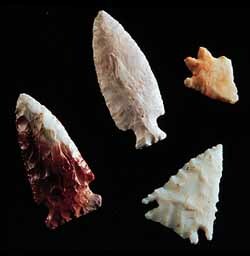 Native American hunters still chipped stone to make points. But they replaced the large, heavy Early Archaic spear points with smaller dart points that would fly farther and more readily penetrate an animal. Large pointed, chipped-stone tools were still used as knives.